Products / The Christmas Cup of Cheer - SOLD OUT!!! The Perfect Gift for Tea Lovers! The Loving Human Receives 4-6 Items Relating to Tea, Dogs and The Holidays; Including an Adorable Set of 4 Tea Cups with Whimsical Christmas Dogs on Them! 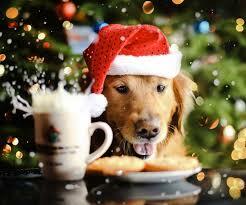 The Reserved Dog Receives TEADOG; Tea Made Exclusively for Dogs, Holiday Tea Biscuits and a Holiday Toy! SPOT ON!